Pooja Hegde was the runner-up in the Miss India (Universe) contest in 2010 but it took her two years to plunge into films. Though based in Mumbai, like many beauty queens she has chosen to make her debut in Tamil films, in Mysskin's Mugamoodi. 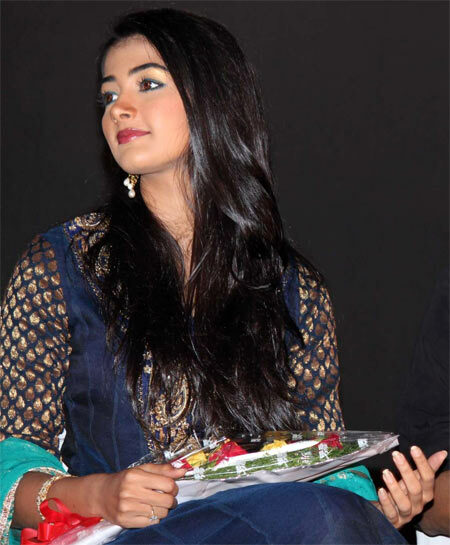 Pooja Hegde talks about her first film. Was it a natural step to move from beauty pageant to films? The truth is, I never dreamt of being in films. I was quite happy modelling. I didn't know I could act, so I never looked at films as a career. Though I had been getting a lot of offers from Hindi, Telugu and Tamil, I declined all of them as films were not a priority for me. I never even tried to find out what the roles were. I was simply not interested in films. I have not acted in a single play in my life, not even in school. Why did you finally choose to say yes to Mugamoodi? As I went on refusing film offers for three years, my mother one day told me that there must be something in me otherwise so many film-makers wouldn't be offering me films. She told me to give it a try. That was why I met Mysskin. How did the offer from Mysskin come to you? It's a funny story. A friend of mine sent my pictures to somebody who in turn sent them to somebody and they reached Mysskin. That meant three people were involved in my photos reaching Mysskin! He wanted to meet me, so I decided to go to Chennai. After meeting him, everything clicked. Was it the role that attracted you? It was a whole lot of things, not just the role alone. The film was produced by UTV Movies and that was a big attraction. It also had a big hero and a successful director. Did you know anything about Mysskin at that time? Frankly, no. Living in Mumbai, you don't really know much about south Indian films. But after I signed the film, I read about him and watched his films like Anjathe. Did you know about your co-star Jiiva? No. People in Mumbai know only Rajnikanth, Kamal Haasan, A R Rahman and Mani Ratnam. Yes, I knew about Suriya and Prakash Raj also! I googled and read more about Jiiva. My brother who was studying medicine at Dharwad used to watch a lot of Tamil and Telugu films. So, he updated me on Tamil films. Did you enjoy acting with Jiiva? Yes. He is a chilled out person and it helps a debut actress a lot. When your co-artiste is cool, you will not be nervous. I had seen Narain (who is the antagonist in the film) in Anjathe and I found him a very good actor and an intelligent guy. Were you nervous during the shoot? I was more excited than nervous. I was really looking forward to the movie to start as it was my first film experience. Till then, I had only watched films, and I enjoy watching films. How was it shooting your first scene? It was a day shoot. I cannot tell you what my first scene was as it is the suspense part in the film. But there was a lot of action and there was Jiiva also in the scene. How did you manage to act in a language that you do not know? Yes, I am not familiar with Tamil. I am born and brought up in Mumbai but I am a Kannadiga who speaks Tulu at home. I found a lot of similarity between Tamil and Tulu. So I could understand some Tamil words. I wrote all my dialogues in English and also wrote down the meanings of the words and sentences. I don't like to learn the dialogues by heart without knowing the meaning. I worked hard to master the language. After the first day's shoot, were you confident that you could act? Actually, I am a bit harsh on myself. But the director was happy with my work. He had explained to me the character in detail and how she would behave, how she would react to a particular situation and how she would say the dialogues. So, that way, it was easy. He wanted me to be very natural and realistic. What is it that you liked about your character? The character, Shakthi, is quite like me. She is very proactive, and not someone who takes things lying down. Another thing I like about Shakthi is that she likes kids, like me. I had a lot of scenes with kids, which I thoroughly enjoyed. Was Mysskin a tough taskmaster? He is a bit tough but only when you are working. The atmosphere on the sets was very relaxed and not tense. How much are you looking forward to the release? I am very excited. I can't wait for August 31, the release date, to come. I will be in Chennai when the film releases and I will be in the theatre watching the film with the audience.